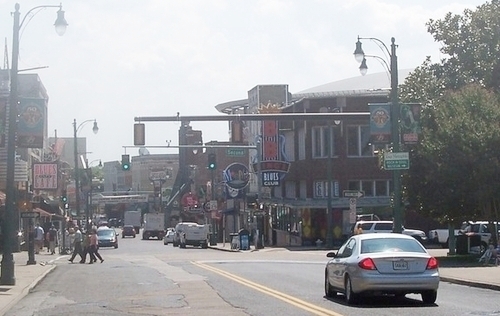 Hot times on Beale Street, Memphis, 2006. Note the pedestrians in long pants. It’s hot right now in the Midwest, though nowhere near as steamy as the triple-digit extremes that the unfortunate citizens of our Eastern Seaboard are experiencing. Nevertheless, once the temperature tops 90° Fahrenheit and surpasses that benchmark on a daily basis, those of us with the luxury of air-conditioned homes and cars take a little longer to acclimate. We even start to ponder how the world ever got along without air conditioning, ignoring the fact that much of it still does. Once you’re used to living in perpetually comfortable environs, it’s easy to get so accustomed to it that the seasonal highs of the summer months seem almost like an affront from nature. “What did you do?” she asked, never having known such discomfort. I recalled the ever-present drone of box fans propped in our bedroom windows, which made sweltering summer nights more bearable. When temperatures approached record-breaking highs, there was some debate as to whether window fans should be reversed in order to draw hot air out of the house, but I always preferred to maintain a strong current of air through my room, no matter how hot. Better a warm breeze than stagnant heat. To a certain extent, I suppose one’s heat tolerance is affected by whatever measure of discomfort seems normal. I certainly made things worse for myself during all of my childhood summers due to my preference for full-length jeans instead of shorts, even on the hottest days. Add to that the calf-length tube socks with multi-colored cuff stripes that no one seemed embarrassed to wear in the 70’s, and I begin to get uncomfortably warm at the memory of such summer attire, even as I type this with bare legs extending from my laptop in my air-conditioned living room. Then again, my old Acer does run rather hot sometimes, so perhaps it’s not all in my mind. I was reminded of my uncomplaining allegiance to jeans during a family visit to Memphis a few summers ago. It was a wonderful vacation, yet it was remarkably hot when we were there. We had a hotel near the end of the streetcar line, so our ventures into downtown were via trolley, and we were out on the streets much of the time. Trudging up historic Beale Street after lunch one oppressively sticky afternoon, we were delighted to discover the small, air-conditioned lobby of the Visitor’s and Convention Bureau. We ducked in for a few minutes, if only to remember what it was like to breathe effortlessly. That evening, the marquee at the Arby’s where we enjoyed a round of milkshakes indicated that the temperature was still over 100°. It was the one and only time that we ever bought a second round of shakes for the road. Yet throughout that sweat-drenched day, we observed many a Memphisonian striding vigorously across the steaming asphalt wearing long, denim pants. Do they save their shorts for the days when expanding mercury explodes their thermometers? Perhaps the hottest day in my memory happened nearly thirty years ago during a cross-country trip with my parents. We were parked in the enormous lot of Circus Circus, at the time the only casino in Las Vegas that admitted minors (this was shortly before the Strip’s brief flirtation with being “family-friendly” and long before the descent into “What happens in Vegas stays in Vegas” depravity). The temperature was well into triple digits as we passed the afternoon inside the cool and cavernous casino. When we returned to the lot to leave, however, we were astonished by the superheated interior of our old Volare. I had stupidly left a box of cassette tapes on the rear dash, resulting in some of them being melted beyond use. Most remarkable, though, was our rear-view mirror. It was no longer attached to the windshield, the industrial adhesive that had previously secured it there having failed in the heat. My favorite instance of unexpected melting, however, occurred one spring afternoon many years later when my wife and I had taken our young family to a community Easter egg hunt. While we were there, my brother paid a surprise visit to our home to deliver a festive hollow chocolate bunny to his niece. Finding the house empty and not knowing our whereabouts, he left the tall, rectangular box on our porch, where it eventually encountered the strong rays of the sun. When we got back home, we were mystified by the presence of an empty bunny box at our front door, at least until we peered through its cellophane window and discovered a pair of candy eyes floating atop a pool of brown goo. Such is the peril of warmer temperatures. Chocolate Santas never face such a fate. Of course, there is always the long-running argument over which is the worse to endure, blistering heat or bitter cold. The wonderful thing about living in Ohio is that we usually get an annual dose of each extreme. Whenever you find yourself at either end of the spectrum, it’s always fun to contemplate the opposite end. For example, only six months ago, I was concerned about the undercarriage of my Civic as I repeatedly bottomed out against the deeply rutted ice that city plows had been unable to remove from our street. This is amusing to me today, when I might easily cook breakfast by leaving a plate of raw eggs on my dashboard. Yet the snowy days shall return, and we will have the advantage of leaving our groceries in our trunks for as long as we like. All of these experiences come to mind on these muggy days, when napkins and coasters must be employed to absorb the condensation rings from our drinks, and asphalt driveways are too hot for bare feet. I suppose there are those rare individuals who thrive in these conditions, but most of us seem inclined to pine for cooler times. Sure enough, we will be craving the freedom of short sleeves and sandals come February. 1 comment on "Hot Hot Hot"
Perhaps the most heat intolerant person I know is Katie. How this happened, I haven’t a clue, as the old song says, as she was not raised with lots of air conditioning – quite the contrary. We didn’t get any air until she was around 10 and Dave came home one day to find all of us sporting sweat-soaked clothing, bare feet and hair plastered to our scalps with rivulets of sweat running down our faces, dripping onto our wet chests. And then it was only a window air conditioner in the common area that never affected the bedrooms. She now lives in an ice castle most of the year, throwing the on switch at the slightest hint of warmth, even during winter months. She was pregnant for Tristan when Dave, Ashley & I were in Africa riding taxis with broken windows and no air -steaming in the back seats, breathing in vast amounts of dirt and unable to separate bodies from seat mates, thus intensifying the feeling of equatorial hotness. The phrase we uttered most often during that trip as we smiled and nodded at each other was, “Katie would HATE this!,” as we envisioned the ranting that would be emanating from her mouth everywhere we went. But, as you know, I am not a fan of air conditioning and don’t have it on now as I type this -kills my joints with pain, congests my sinuses and makes my nose run -good thing we live in a woodsy area!